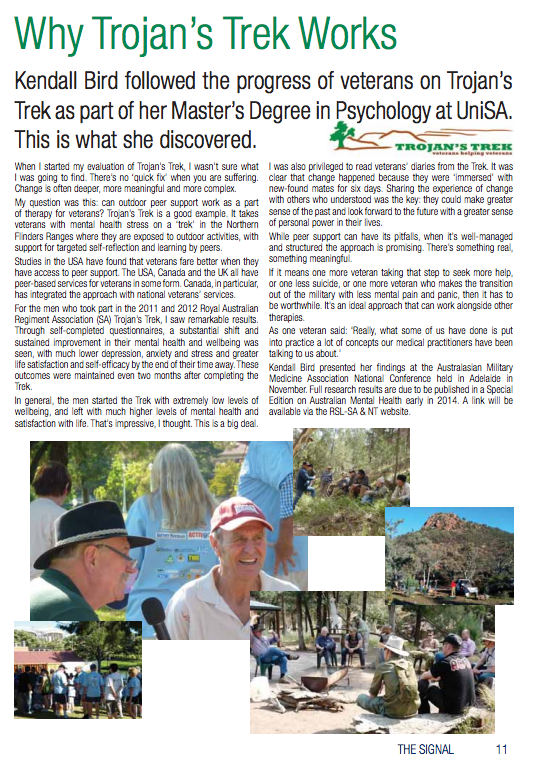 Kendall Bird followed the progress of veterans on Trojan’s Trek as part of her Master’s Degree in Psychology at UniSA. This is what she discovered. veterans with mental health stress on a ‘trek’ in the Northern Flinders Ranges where they are exposed to outdoor activities, with support for targeted self-reﬂection and learning by peers. Through self-completed questionnaires, a substantial shift and sustained improvement in their mental health and wellbeing was seen, with much lower depression, anxiety and stress and greater life satisfaction and self-efﬁcacy by the end of their time away. These outcomes were maintained even two months after completing the Trek. Studies in the USA have found that veterans fare better when they have access to peer support. The USA, Canada and the UK all have peer-based services for veterans in some form. Canada, in particular, has integrated the approach with national veterans’ services. For the men who took part in the 2011 and 2012 Royal Australian Regiment Association (SA) Trojan’s Trek, I saw remarkable results. Through self-completed questionnaires, a substantial shift and sustained improvement in their mental health and wellbeing was seen, with much lower depression, anxiety and stress and greater life satisfaction and self-efﬁcacy by the end of their time away. These outcomes were maintained even two months after completing the Trek. In general, the men started the Trek with extremely low levels of wellbeing, and left with much higher levels of mental health and satisfaction with life. That’s impressive, I thought. This is a big deal. I was also privileged to read veterans’ diaries from the Trek. It was clear that change happened because they were ‘immersed’ with new-found mates for six days. Sharing the experience of change with others who understood was the key: they could make greater sense of the past and look forward to the future with a greater sense of personal power in their lives. Kendall Bird presented her ﬁndings at the Australasian Military Medicine Association National Conference held in Adelaide in November. Full research results are due to be published in a Special Edition on Australian Mental Health early in 2014. A link will be available via the RSL-SA & NT website.